Hatters boss Nathan Jones hailed striker Danny Hylton as a ‘wonderful signing’ ahead of his 100th game for the club this evening. The 29-year-old, who joined along with defender Johnny Mullins from Oxford United in the summer of 2016 has made 99 appearances so far, scoring a superb 55 goals, putting him joint 22nd in the club’s all-time top scorer list with Bob Morton. 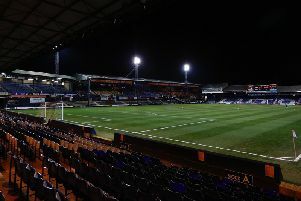 Hylton is now available again after missing the last three games due to suspension, and on the impact he has made at Kenilworth Road during his two years, chief Jones said: “Danny’s been a wonderful signing for this football club. "We tend to look at a few of the negatives with Danny, but be under no illusions, he’s been a fantastic signing. "When we did sign him, we were at the time where were building, but he was that first signing (of the summer) and I do believe that he had the knock on effect to us getting other players because he was a marquee signing at the time. "We signed a few marquee players over a time and Danny was one of them. "He’s repaid me no end, what he does, yes you have to put up with certain things from Danny, but I’m willing to put up from what I get as I know what he’s like as a character. "I know what he’s like around the training ground, I know what he’s like in games and I know what he puts up with. "I know some of the things he has to put up with on a football pitch, so for me he’s been a wonderful player, a wonderful addition to this club and I’m very proud of him."